Sam Narron, one of the ghosts during the Johnston County Heritage Center’s Ghost Walk. 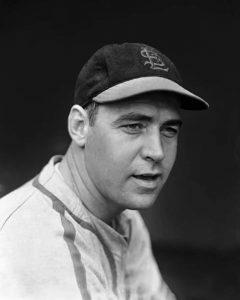 Mr. Narron grew up in O’Neals Township and played for the St. Louis Cardinals in the 1930s and 40s. He is being portrayed by his son Richard “Rooster” Narron of Goldsboro. 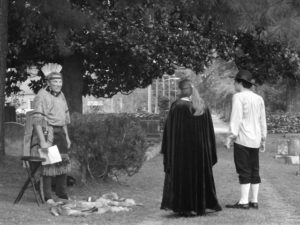 Six characters from Johnston County’s past will be brought back to life on Thursday, October 25th during the Johnston County Heritage Center’s 14th annual Ghost Walk in Smithfield’s historic Riverside Cemetery. This unique event is sponsored in part by the Johnston County Visitors Bureau and presented in conjunction with the Downtown Smithfield Development Corporation. It will begin at 6:30 pm at the corner of Church and Second streets beside St. Paul’s Episcopal Church. This year’s line-up includes 18th century English explorer John Lawson; Miss Susan Hayes, a teacher from Maine who was responsible for building a Freedmen’s Schoolhouse which is still standing in Smithfield; Mattie Thomas, a formerly enslaved teen-ager who was one of Miss Hayes’s students; Flonnie Massey Parker, a victim of the 1918 flu epidemic; Major League Baseball player and coach Sam Narron; and Charlie Straughan, a Selma night policeman who was an eyewitness to the Catch-Me-Eye explosion in 1942 . The cast includes Rooster Narron; Smithfield Police Officer W. T. Faircloth; Neuse Little Theater veterans Shaun Braswell, Rachel Dennis, and Theressa Rose; and Elom Lewis, who has performed with Clayton Youth Theater. Visitors will be given guided tours through the cemetery where they will meet each ghost character. The tour concludes with refreshments at the historic Hastings House, where Confederate generals were headquartered at the end of the Civil War. Admission charge is $5 for adults and $3 for students (free for children under age 6), payable at the event. No advance tickets will be sold. For further information, call the Heritage Center at 919-934-2836, or visit the Center’s website at www.jcheritagecenter.org or Facebook page, www.facebook.com/jocoheritage.